Throwing on the potter's wheel makes some heavy demands on clay bodies. There are three key characteristics necessary for a clay body to work well for throwing. Throwing clays must have a high degree of plasticity, they cannot absorb too much water while being thrown, and they must be strong enough to hold their shape while being worked. The absolutely crucial characteristic of all clays used for throwing is that of plasticity. Without a very high level of flexibility, the clay simply won't be workable on the wheel. 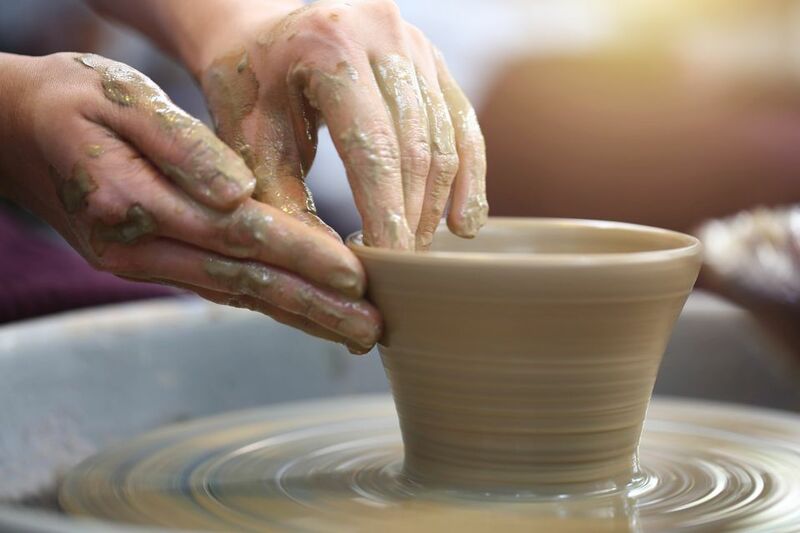 Even moderately plastic clays can take a toll on the potter's hands and wrists, due to the strength and pressure required to make the clay move. Ball clays are highly plastic and are often used in throwing clay bodies. However, this is a ​trade-off; the more plastic a clay is, the more it will shrink and the greater its tendency to warp while drying. Plasticity must be maintained in a balance with other clay body characteristics. Throwing clays must be highly plastic, but also retain enough strength to stand upright when thrown into thin-walled, tall forms. 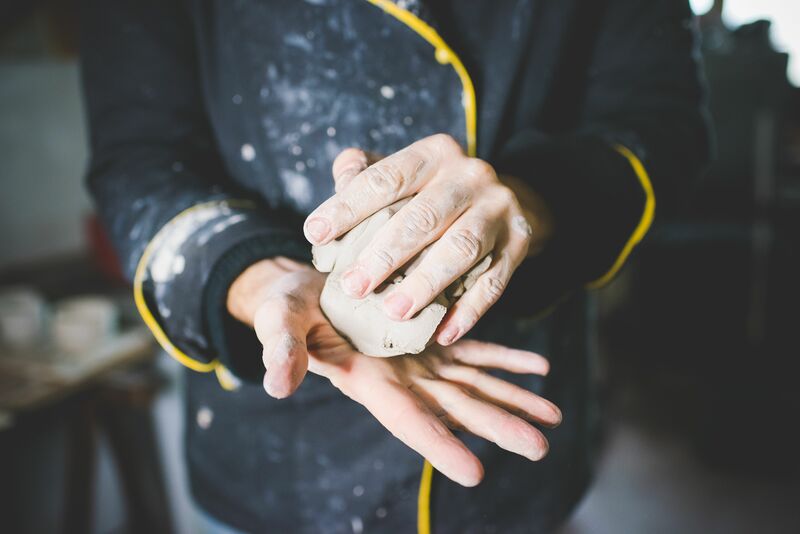 To this purpose, throwing clay bodies contain some coarser particles to give them strength. Throwing clay bodies are likely to contain fire clays, fine sand, grog, or a combination of these. When grog is used in a throwing body, it is best if it is sized to pass through a 30-mesh screen, but not through an 80-mesh screen. This "30-80" grog allows for the strength needed for throwing, without being so coarse as to be painful on the potter's hands. In general, a throwing clay body should contain no more than 8% to 10% of coarsely particled material. Clay absorbs water while it is being formed on the potter's wheel, which is why the longer a clay is worked on the wheel, the softer it becomes. Water absorption, then, can become a problem. Plastic clays that are on the stiff side when being wedged will absorb less water when they are on the wheel. Unfortunately, this also means that the clay is harder to work with and is tiring to the potter. Working with stiff clay can also hurt muscles and joints. Plastic clays do absorb less water than coarse materials such as fire clay or grog, which open a clay body up. Again, a good throwing clay must be balanced between plasticity, strength, and water absorption. Aging lends better workability to a clay body. To age clay, it is left open to the air for a day or two after mixing and before covering. This allows microscopic organisms to move into the clay and grow. These organisms produce organic polymers which add more plasticity to the clay with none of the drawbacks of using too much fine-particled clay to achieve the same level of plasticity. The one drawback aged clay has is that is stinks like swamp mud. Many potters mix their clay, let it develop a colony of organisms, then store it for one to six months before using it. Clay bodies that have nepheline syenite in them, however, should never be stored more than three months, due to possible ionization of the clay particles. Finding the right clay for you is very important. Some clays are basically unthrowable, even by the best potters. It is a real tragedy when a person underestimates their own skills simply because they are working with unsuitable clay. Within the above framework of what makes a clay body good for throwing, it is up to you to decide what temperature range and what coloration you are looking for in your perfect throwing clay body. What Is a Ceramic Clay Body in Pottery? Can You Have Mold Reactions to Clay?